Beverly Hills plastic surgeon Dr. Babak Azizzadeh introduces SCULPThera, an innovative non-invasive facelift procedure. Dr. Babak Azizzadeh recently introduced SCULPThera, a new anti-aging combination therapy, at the CENTER for Advanced Facial Plastic Surgery in Beverly Hills. SCULPThera utilizes both Sculptra injections and Ulthera skin tightening to improve rejuvenation results. “I think the combination therapy truly enhances the results due to multi-layer tissue stimulation; Ulthera to the SMAS and Sculptra to the subcutaneous and submuscularis regions. Furthermore, both laxity and volume restoration is accomplished,” said Dr. Azizzadeh. The goal of SCULPThera treatments is to provide patients with a non-surgical facelift alternative. Dr. Azizzadeh uses Sculptra injections to address volume loss in patients. Sculptra Aesthetic is a volumizing filler made of poly-l-lactic acid, which stimulates the body to produce new collagen to replace the natural volume (fat) loss that occurs with aging. Since Sculptra stimulates the body to produce collagen, the results look more natural and can last for up to two years. In the same appointment, Dr. Azizzadeh will also treat the patient with Ultherapy to tighten loose or sagging skin. Ulthera uses intensive ultrasound to directly impact the deep tissue layer, thereby tightening the skin. This treatment can be used safely and effectively to lift the brow, tone a sagging jawline and tighten a loose neck. Individually, both treatments can provide patients with good anti-aging results, but when used simultaneously, the results are truly impressive. A good candidate for SCULPThera is someone with mild skin laxity and volume loss. Both of these non-surgical treatments provide an effective facelift alternative. “Although the results of SCULPThera are not permanent, they are long lasting and require touch-up treatments every 2-3 years,” said Dr. Azizzadeh. 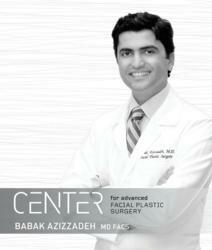 Dr. Babak Azizzadeh, the Chairman and Director of the CENTER for Advanced Facial Plastic Surgery in Los Angeles, is a Harvard-trained facial plastic surgeon, specializing in cosmetic and reconstructive plastic surgery of the face, eyes and nose. He is double board-certified by the American Board of Facial Plastic and Reconstructive Surgery as well as the American Board of Otolaryngology-Head & Neck Surgery. His expertise in cosmetic and reconstructive plastic surgery has made him one if the most sought-after surgeons in the country. In addition, Dr. Azizzadeh is also highly skilled in non-surgical facial rejuvenation treatments, including lasers, Ulthera, injectables, fat grafting, chemical peels and liquid facelifts. He has written 5 medical textbooks, lectured around the world and been featured in national media outlets including The Oprah Winfrey Show, The New York Times and Discovery Health for his extensive knowledge in facial plastic surgery.